To aspire to become a world-class University by tapping human resources from all sections of society by offering them opportunities to learn across disciplines, and to build human capital, men and women of character and competence capable of being leaders of tomorrow and solving problems arising out of fast changing realities – global and local. Built on a great legacy inherited from our founding fathers, our mission is to create an environment of stimulating intellectual dialogue across disciplines and harvest knowledge with a cutting-edge through high quality teaching, research, and extension activities leading to the generation of students who would provide leadership, vision and direction to society. Our goal is to realize this vision by 2025. Our strategy is to develop innovative programmes in basic and emerging disciplines in a phased manner and to update them periodically so as to keep ourselves on track and on time. Our commitment is to involve the faculty and students in interactive learning environment both within and outside the University through contextual and experiential programmes so that they would be builders of a worldwide-network of knowledge-sharing and excel in their performance with a winning edge in the wider context of globalization. The motto of the University is well engraved on its emblem: (depicting the bird ‘Gandabherunda’ flanked on either side by lion-elephant Sharaba – a mythical creature believed to be stronger than lion and the elephant and the upholder of righteousness) that “Nothing is equal to knowledge” (“Na hi Jnanena Sadrisham” - an excerpt from Rigveda) and “I always uphold the truth” (Satyamevoddaharamuaham). Thus the greatness of knowledge and the commitment to adhere to truth are the ideals, the University is pursuing all through its existence, and in its path of success. The main campus named "Manasagangotri"– eternal flow of the mind – by the Poet-laureate ‘Kuvempu’, the former Vice-Chancellor, and the first ‘Jnanapeetha’ awardee, is located on 739 acres of picturesque land containing a sprawling Kukkarahalli lake surrounded by verdurous trees extending to an area of 261 acres. In addition to the main campus, there are three campuses located in Tubinakere near Mandya, Hemagangotri near Hassan and at Chamarajanagara. 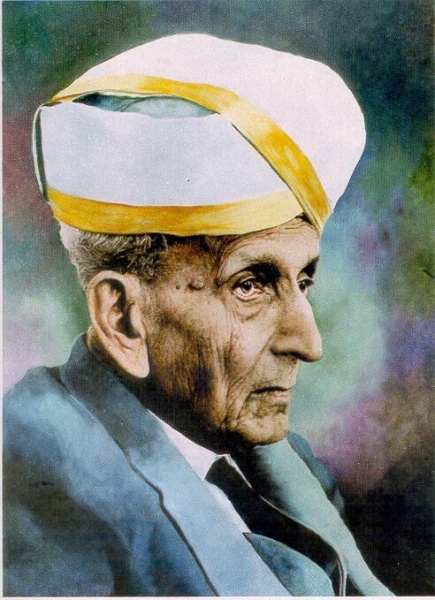 The Tubinakere campus near Mandya is known as Sir M. Visvesvaraya Postgraduate Centre and is located on the Mysore-Bangalore highway at a distance of about 8 kms from Mandya. The Postgraduate Centre at Hemagangotri, Hassan is located near Kenchattahalli village on the Mangalore- Bangalore highway at a distance of about 10 kms. from Hassan. Dr. B. R. Ambedkar Post-Graduate Centre of Mysore University is located at Chamarajanagar, the Southern most district Headquarters of Karnataka State. There are 63 PG Departments offering 76 Postgraduate Programmes with more than 1,20,000 UG, PG, M.Phil, and Ph.D students. There are 226 affiliated colleges, 66 Recognized Research Centers, 157 Outreach /Research Centers, 8 training centers, 47 specialized programmes, 38 Foreign collaborations and 27 National collaborations. Further, there are 11 PG Departments with National Research Facilities, 14 Chairs, 13 DST-FIST, UGC-SAP funded departments and 13 supporting units. Enrollment of a large number of overseas students from 63 countries reflects the international reputation of the university. Ranked 36th (University Category) and 57th (overall category) in India Rankings 2017 conducted by NIRF, MHRD, Govt. of India. Ranked 9th (State Universities) and 15th (India Universities)in India’s Best Universities 2017 survey conducted by Hansa- The WEEK National Ranking 2017. University of Mysore was the first University in the State that was accredited by National Assessment and Accreditation Council (NAAC) in the year 2000 with Five Stars Status. Second cycle of re-accreditation by NAAC in 2006 with A+ Level. Identified as one of the top 20 universities in Scientific publications and was awarded Rs.9.00 Crore under PURSE Scheme, and renewed for 2nd Phase in 2016 awarded 8.5 crore. The overall h-index (Web of Science) for published research: 42 with 3609 publications since 1986. Some faculty members of the University have a h-index of 18 and above. The University was granted autonomy in 1956. Originally the territorial jurisdiction of the University consisted of nine districts of Karnataka State. With the creation of Bangalore University in 1964, Mangalore University in 1980 and Kuvempu University in 1987, the territorial jurisdiction of the University of Mysore is now confined to the four southern districts of the State, viz, Chamarajanagara, Hassan, Mandya and Mysuru. Popular Personalities Served / Contributed. 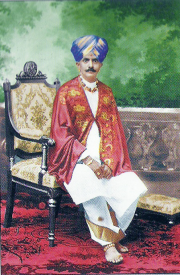 The University of Mysore celebrated its centenary year during 2015-16. 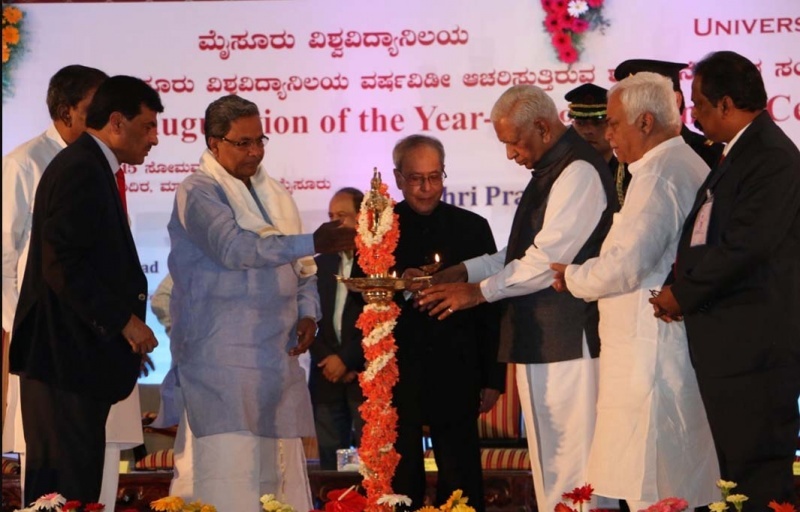 The year-long celebrations were inaugurated by the Hon'ble President of India Shri Pranab Mukherjee on July 27, 2015. As part of the celebration, 8 Nobel Laureates delivered special lectures. Throughout the year seminars and workshops were conducted by various departments inviting eminent scholars. The Valedictory address was delivered by the Hon'ble Vice President of India Shri Hamid Ansari on July 22, 2016. University of Mysore in association with Indian Science Congress Association has successfully organized the 103rd Indian Science Congress during January 03-07, 2016. 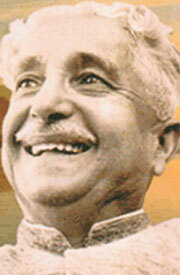 The focal theme of the congress was “Science and Technology for Indigenous Development in India”. 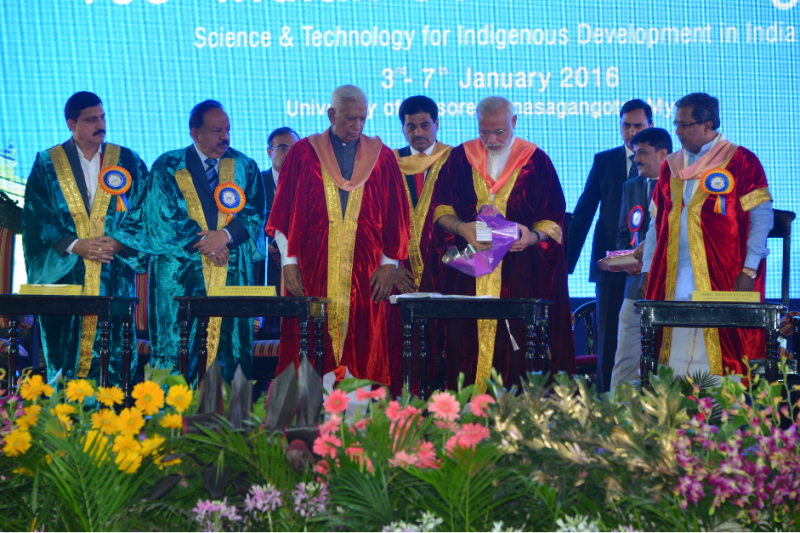 It was inaugurated on January 3, 2016 by the Hon’ble Prime Minister of India Shri. Narendra Modi. Altogether 18,528 delegates were registered their names for the conference. Around 600 delegates from foreign countries namely USA, Canada, UK, Australia, Japan, Korea, France etc, have participated in the Congress. Six Nobel Laureates, one Field Medalist, one Bharatha Rathna and eminent scientists of national and international repute have delivered lectures during the congress. There were totally 28 plenary sessions, 25 symposia and 18 technical sessions pertaining to different disciplines of science and technology. Also, Women Science Congress, Science Communicators’ Meet and Children Science Congress were organized. The Indian Academy of Social Sciences (IASS) in association with the University of Mysore, which celebrated centenary year, organized the 40th Session of Indian Social Science Congress from 19-23 December 2016 with the focal theme “People’s Health and Quality of Life in India”. The president of ISSA, Allahabad Prof. B. M. Hegde inaugurated the congress. Almost all the chairpersons and conveners of 28 research committees and 21 thematic panels took part in the mega event. More than 5000 social scientists and delegates participated in the deliberations of the congress. A grant of Rs. 100 crore by Ministry of Human Resource Development (MHRD), Government of India elevated the University to the status of Institution of Excellence in the thrust area of Bio-diversity, Bio-prospecting and Sustainable Development. The Institution of Excellence is a prime productive research and Core Instrumentation facility created under the University. This houses facilities for NMR, NGS, LCMS, XRD, Imaging and Cell culture in Vijnana Bhavan specially constructed out of this grant. The University of Mysore is offering graduate and postgraduate degree, diploma and certificate and Ph.D. programmes. There are five faculties, viz., (1) Arts, Humanities and Social Science (2) Commerce and Management, (3) Education, (4) Law, (5) Science and Technology. The distinct strength of the University lies in providing high quality teaching and research backed by well qualified and experienced teachers, with a strong focus on Education, Fine Arts, Humanities, Languages, Law, Physical Education, Pure and Applied Sciences, and Social Sciences. Most of the postgraduate departments are of international repute and known for excellence in research. Research projects worth crores of rupees have been sanctioned to various University departments by national and international institutions and funding agencies. The Department of Science and Technology (DST) of the Government of India has recognized the Department of Studies in Botany, Bio-Technology, Microbiology, Physics, Sericulture and Statistics under FIST programme. The University Grants Commission (UGC) has recognized the Department of Studies in Bio-Chemistry, Bio-Technology, Chemistry, Commerce, Computer Science, Earth Science, Food Science and Nutrition, Journalism and Mass Communication, Library and Information Science, Mathematics, Physics, Political Science, Statistics, Zoology and Kuvempu Institute of Kannada Studies under the Special Assistance Programme (SAP). In an effort to move towards the complete version of the CBCS-CAGP scheme as emphasized by the UGC and to provide greater autonomy, the University has permitted the departments to run the programmes under Flexible CBCS-CAGP from 2017-18. University Grants Commission (UGC Project) has sanctioned Rs.50 crores considering University of Mysore as University with Potential for Excellence (UPE) in the year 2012, for the period of five years and extended for one more year. The project planned in two different areas; Focused Area – I: Processing, Characterization & Applications of Advanced Functional Materials, Focused Area – II: Media and Social Development – A Case study of Karnataka. The following facilities were established under this scheme - High Performance Computing Environment (HPC), Adoption of Green Technology in the University Campus, Centre for Education of Visually Challenged –Drushtee, Multimedia Learning Resource Creation Centre (MLRCC), Earn While You Learn Scheme, Workshops, Conferences and Seminars, Centre for Proficiency Development, Upgradation of Printing and Publication Units, Books and Journals, Sports and Games, Strengthening of Department Laboratories and Hostels and E-governance. The University of Mysore has been in the forefront in extending non-formal education in Information Technology to the public through CIST, housed in the imposing Senate Hall complex at Manasagangotri. This is an ISO 9001-2000 Certified Centre. CIST offers various postgraduate degree, postgraduate diploma and diploma courses encompassing several horizons of Information Technology. Students on the campus may acquire and upgrade their computer skills concurrently with their regular academic programmes, through non-formal training programmes offered by CIST and thus get themselves equipped to face the challenges of the modern world. The EMMRC was established in 1996 as Audio-Visual Research Centre (AVRC). The name AVRC was changed to EMMRC in August 2004. This is the only institution of its kind to be established by the UGC in the entire Stateof Karnataka. EMMRC produces educational videos for 24 -hour educational television channel and Doordarshan’s National Network DD-1. The School of Planning and Architecture was established in the year 2002 and is located in the pristine environment of the Manasagangotri campus which is condusive for the growth and promotion of creative and competitive design ideas. The School promotes young talents in the professional field of Architecture and Design. The School offers B.Arch, B.Tech(Planning) and M.Arch. courses on a regular basis, approved by the Council of Architecture (COA), New Delhi. The curriculum is structured and imparted in an extremely student- friendly manner. A student graduating at any point is equipped and trained to handle projects independently or could work in an office or organization. The administrative offices of the University are housed in the Crawford Hall, an imposing building adjacent to the Kukkarahalli lake, known for its scenic splendour. The Offices of the Vice-Chancellor, the Registrar, the Registrar (Evaluation), the Finance Officer and the Public Grievance Cell are located in this building. The Office of the Administrative Officer, situated at Manasagangotri, looks after the activities of the postgraduate campus. Facilities for co-curricular activities exist in the University. There are five auditoria - one each at the Maharaja’s College Centenary Building, the University College of Fine Arts for Women, Humanities Block at Manasagangotri, Bahadur Institute of Management Studies (BIMS) and EMMRC, Nalwadi Krishnaraja Wadiyar, auditorium, MGM. In addition, most of the departments have well-furnished conference halls. These facilities are available for use by the students for cultural programmes and competitions such as debate, music, dance, drama and also for special lectures. Manasagangotri also has a spacious open-air theatre with a seating capacity of 10,000 where cultural programmes for large gatherings could be held. The Principal Authorities of the University are the Syndicate, the Academic Council, the Finance Committee, the Planning, Monitoring and Evaluation Board, the five Faculties and the Board of Studies. The University is governed by the Karnataka State Universities’ Act, 2000. 1,500 books in various subjects, dictionaries, encyclopedias and monographs. The University of Mysore is a leader in solarization of its campus with solar power provided in all street lamps and providing solar water heaters in all hostels. The campus has a good number of flower-full gardens and lawns. The ambience is comparable with some of the world-class universities including the pleasant weather, noise-free environment and student-friendly atmosphere. The State Bank of India has two branches in the University, one at the Manasagangotri Campus and the other at Crawford Hall, which provide banking and ATM facilities. There is a centrally located canteen on Manasagangotri campus which caters to the needs of students, faculty and the general public. The Centre for Competitive Examinations located at EMMRC building provides special training to equip students for various Competitive Examinations such as IAS, KAS, IPS, IFS, NET and SET, Banking Services etc. Today, against the backdrop of globalization, candidates with proficiency for employability have manifold opportunities for placements. Proficiency is the key to employability, individual excellence and social involvement. To gain an overall proficiency, students need to be equipped with a variety of skills such as communication skills, language competency, analytical skills, application skills, organizational skills, inter-personal skills, innovative skills, entrepreneurial skills, etc. Keeping in view the need for systematizing the activities of skill development, proficiency enhancement, and personality development, and establishing liaisons for placements, the University of Mysore has established the Centre for Proficiency Development and Placement Service (CPDPS). The Centre keeps liaison with different Institutions, Industries, Government Departments and such other organizations, and collects information about job opportunities and creates and maintains up-to-date database in this respect. It facilitates unemployed graduates and postgraduates so that they could be placed in different sectors through on-campus and off-campus interviews, and other modes of selection processes. The University Employment, Information and Guidance Bureau, located in the University Library building at Manasagangotri provides information on courses and careers. Pamphlets and booklets are displayed at the Bureau Office. Lectures and seminars are arranged in various colleges to highlight employment opportunities. Information about courses in other universities within the country and abroad is also provided. Students can register their names for employment assistance at the Bureau. There are two Health Centers - one located on Maharaja’s College campus and the other at the Manasagangotri campus of the University of Mysore, to take care of the medical needs of the students, faculty and staff of the University. The International Centre is located at the University College of Fine Arts at Manasagangotri. This is a single-window system facilitating the academic requirements of foreign students. It provides guidance and counseling to foreign students regarding admission to various courses in the University, besides assisting them in matters relating to eligibility, admissions, VISA, residential permits, bonafide certificates, etc. The Manasagangotri campus and all postgraduate departments and library have wired and wireless internet browsing facilities. More details can be had from ICD (Information Communication Division), Department of Studies in Computer Science. The UGC has prescribed that a person aspiring to become an Assistant Professor in Universities / Colleges has to qualify in NET (National Eligibility Test) / SET (State Eligibility Test). The UGC and Government of Karnataka have identified University of Mysore as a Nodal Agency to conduct Karnataka SET (K-SET) for Lecturership and this K-SET Centre is located in Moulya Bhavan, behind Crawford Hall, University of Mysore, Mysuru. Details regarding the K-SET examination are available on the K-SET Centre website www.kset.uni-mysore.ac.in. The Library is kept open between 8 AM and 8 PM on all working days, throughout the year, except on holidays. Departmental libraries are also available in some of the post-graduate departments. India Post is running two Post Offices, one at the Manasagangotri campus and the other at Crawford Hall with savings/recurring deposits, telephone and Speed Post services. The State and Central Governments have been awarding a number of scholarships to meritorious and deserving students. Subject scholarships and endowment scholarships are also available. In addition, special scholarships for children of political sufferers, defence personnel and physically challenged are available. 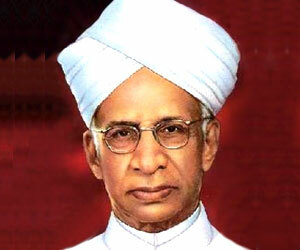 Students belonging to economically weaker sections of the society have the benefit of free studentships. There is a Special Cell to look after the welfare of SC/ST students. The cell also awards fellowships to students for carrying out research. Special coaching classes are conducted for the benefit of SC/ST students appearing for competitive examinations, such as IAS, KAS, IPS, NET and K-SET. Training is offered in the application of computer techniques as well. Bridge-courses are conducted for promoting communication skills, writing and oratory skills. The Cell has a good library facility with books on general knowledge and computers. Financial assistance is also provided to students of the postgraduate departments through the state directorate of social welfare. A separate Directorate of Physical Education looks after the sports activities. The postgraduate sports council looks after sports activity in the Manasagangotri campus. The University of Mysore has vast sports fields, cricket stadium, tennis courts, gymnasium and a well-maintained swimming pool that cater to the needs of students, faculty and sports lovers of the city. Nalwadi Krishnaraja Wadiyar, Gangotri Glades and Three Indoor stadiums are also available. A separate Directorate of Student Welfare located at EMMRC building at Manasagangotri campus, looks after the student welfare programmes in the University. The students are encouraged to participate in co-curricular activities, such as literary and cultural competitions, Inter-Collegiate and Inter-University competitions. The State/ Zonal/ National/ International Youth Festivals are also arranged from time to time. The KSRTC plies city buses to the campus from all corners of the city with a frequency of 20 minutes. The campus is about 6 kms. from the Central Bus Station and 3 kms. from the City Railway Station. The University has an independent Women’s Facilities Centre located next to the Department of Studies in Computer Science at Manasagangotri campus. This is meant for women students commuting from different places who need common resting facility. The University of Mysore has zero tolerance to ragging which is a punishable offence. Every student has to sign a declaration that he/she will not indulge in any form of ragging and other unlawful activities. All the postgraduate campuses coming under the jurisdiction of the University of Mysore are declared “No Smoking Areas” and any violation in this regard would invite severe punishment. •DoS in Physical Education and Sports Sciences hostel, Mysuru. •Postgraduate hostel for Men (Main Block), Manasagangotri, Mysuru. •Postgraduate hostel for Men (New Block), Manasagangotri, Mysuru. •Postgraduate Ladies’ hostel (New Block), Manasagangotri, Mysuru. •Postgraduate Ladies’ hostel (New Wing), Manasagangotri, Mysuru. •Postgraduate Ladies’ hostel (Old Wing), Manasagangotri, Mysuru. •Postgraduate University hostel - II, Saraswathipuram, Mysuru. •Postgraduate hostel (Women), Dr. B. R. Ambedkar Post-Graduate centre, Chamarajanagara.